We welcome our guests to a friendly and cosy atmosphere in our charming old vienna city hotel. Whether you plan a trip with your family, alone or for business or you would like to experience the Viennese charm with an art, culture, music or shopping vacation, we expect our guests between the Wiener Prater and the St. Stephens Cathedral in hearty ambience. After a day of sightseeing, why not release and have a drink or a snack in the relaxed atmosphere of our quiet garden courtyard. In our bar 'Skate In' you are more to welcome to visit us by bike or rollerskates. Your hotel with the personal touch looks forward to your visit and wishes you a pleasant and recreative stay as well as memorable moments in Vienna. 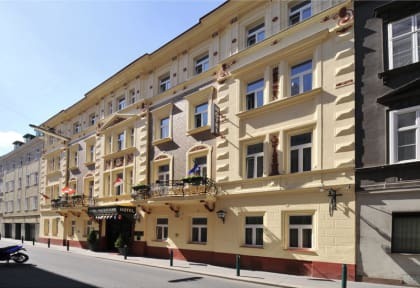 The hotel is located in the second district of Vienna. With the underground you reach in 10 minutes or by feet in 30 minutes the Stephansplatz or the center of Vienna. The Vienna Prater and the Vienna Gigant Ferris Wheel (Riesenrad) is within 5 minutes walking distance. From the hotel you can reach the Vienna Exhibition & Congress Center as well as the UNO City easily in 10 to 15 minutes with the underground. Enjoy your stay in our comfortable and bright furnished rooms. You can choose as desired from single rooms to large family-sized rooms. All our rooms have timber flooring and allergenic linen. Furthermore in all our rooms we have Sat-TV, telephone and WiFi connection (surcharge). Cancellation policy: 14 days before arrival date. Sem qualquer tipo de problema, a estadia foi curta mas bem tranquila e relaxante, como deve ser um hotel. O único problema é a exigência de pagamento em dinheiro. Fora isso, o local é bem localizado, bem próximo do centro da cidade. E a equipe do hotel é bem atenciosa e prestativa.